Here is an update to my crude oil price trend forecast for 2018. 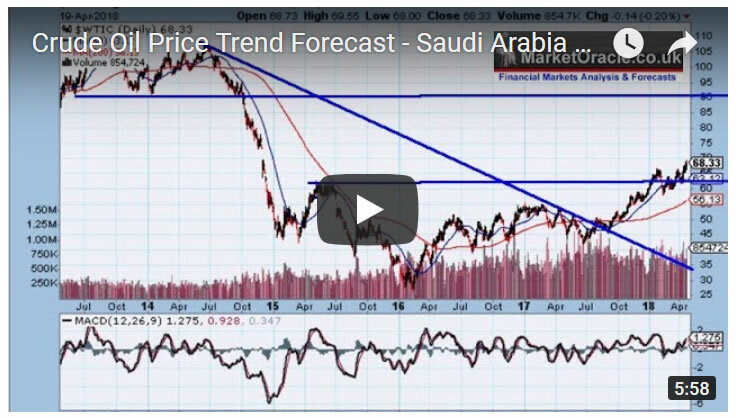 Firstly a recap of my forecast for the crude oil price for 2018 which since the start of this year has been for the oil price to target a trend to $80. 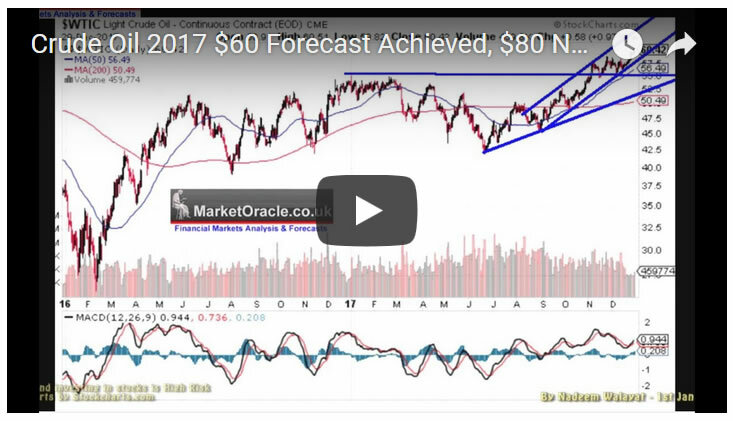 01 Jan 2018 - Crude Oil Achieves $60 Forecast Expectations for 2017, $80 Next? Oil is clearly in a bull market and thus I expect the bullish trend to continue and would not be surprised if we see crude oil break above $80 during the year! My update of late February reaffirmed the $80 target despite the then deep 15% drop. Therefore the crude oil price appears likely to remain within a trading range for the next month or so with-in the high of $67 and a low of $58. Thus given that the oil price is currently at $64 is near resistant then the oil price should soon reverse lower to target $58 which is likely to be the trend for most of March 2018 before the next assault on the high as my longer term 2018 forecast for a $80 crude oil price remains in tact. Whilst my last look at the crude oil price on 20th April again confirmed my expectations for crude oil to hit $80 between August and September 2018. The crude oil price appears likely to remain within a trading range for the next month or so within the high of $69 and a low of $61. Whilst my 2018 forecast for a target high of $80 remains intact and which now looks set to be achieved between late August and early September. So I don't expect the Saudi's to get their $100 crude oil price to dump ARAMCO IPO stock on the market this year. Still if the Saudi's time it right they could sell ARAMCO stock whilst the crude oil price is trading near $80. So here we stand at the end of September with the crude oil price trading at $73 off of its recent high of $76, within touching distance of my $80 forecast target for 2018. The rest of this analysis has first been made available to Patrons who support my work. So to get immediate First Access to ALL of my analysis and trend forecasts then do consider becoming a Patron by supporting my work for just $3 per month. https://www.patreon.com/Nadeem_Walayat.